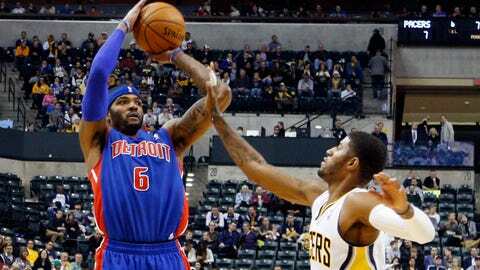 Josh Smith scored 30 points to lead the Pistons over the Pacers. INDIANAPOLIS (AP) Detroit beat Indiana at its own game Monday night. "We’re forming an identity ourselves," said Smith, who went 13 of 29 from the field after meeting with Cheeks about getting more opportunities. "That has to be being a physical team, try to dominate the paint." "I don’t think we were looking ahead at all," Vogel said. "We’ve got to lick our wounds and see what we need to do better." Detroit took charge quickly, using a 10-3 first quarter to take a 23-14 lead – a lead it never relinquished.